The pilgrims first celebrated Thanksgiving in 1621, but it took until 1863 for President Lincoln to declare the third Thursday in November as a national day of thanksgiving. It wasn't until 1941 that Congress declared Thanksgiving a legal holiday and created anxiety for cooks across the country. How to cook a turkey, what to season it with and how long to cook it are the questions on the tongues of even the most seasoned cooks during the holiday season. Thaw your frozen turkey in the refrigerator or in cold water. Thawing a 25-lb. turkey in the refrigerator takes about six days and in cold water about 12 hours. Do not remove the turkey from the plastic wrap when thawing in the refrigerator and wrap the turkey in additional plastic wrap when thawing in cold water. Check the inside of the turkey for the giblets and neck. Remove these from the turkey and set them aside for giblet gravy. Peel the skin from the red onions and chop them into quarters. Remove the papery skin from the garlic heads and separate the cloves. Cut six or seven sprigs each of fresh thyme, parsley, rosemary and sage. Mix the herbs with the onions and garlic. Add four fresh bay leaves to the herb, garlic and onion mix. Remove the turkey from the plastic packaging. Dry it well with paper towels. Rub salt and pepper inside the empty cavity of the turkey. Stuff the herb, garlic and onion mixture into the turkey's cavity. Put the turkey into a large roasting pan, breast side up. Pour 1/2 cup of water in the bottom of the pan. Melt the butter and brush the turkey with half of it. Salt and pepper the outside of the turkey. Insert an oven-proof thermometer into the inside of the turkey's thigh. 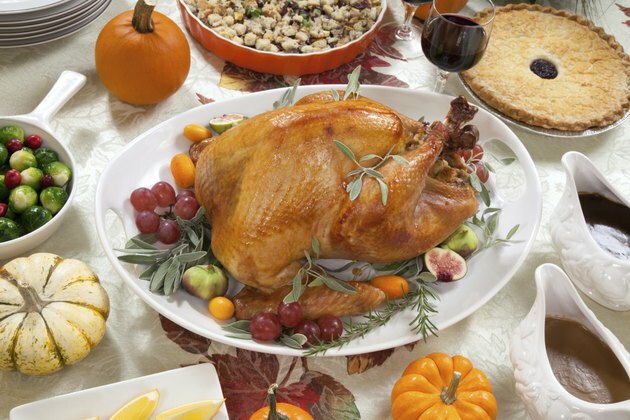 Loosely cover the turkey with heavy-duty aluminum foil, creating a tent with the foil. Do not secure the foil tent to the roasting pan. Put the turkey in the oven and roast for two to two-and-a-half hours. Remove the turkey from the oven and baste with the remaining butter. Place the turkey back into the oven and continue roasting for an additional two to two-and-a-half hours or until the thermometer reads 165 degrees Fahrenheit.